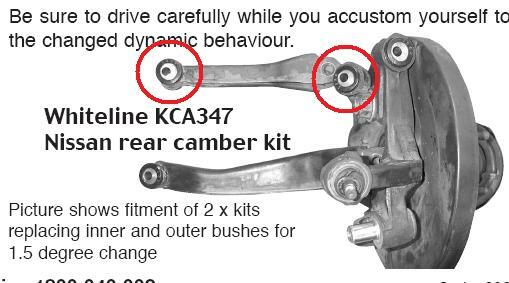 I just orderd myself a whiteline plus adjustable camber kit for the rear of my r33 gtr, just want to make sure im going to be mounting the bush in the right place. Am i meant to mount the new adjustable bush in the rear upper camber arm (the rear upper camber arm has a fork mount on one end were it bolts to the hub and a rubber bush on the other end were it bolts to the subframe mount), do i remove this and replace the factory bush with the whiteline adjustable bush? Or do i remove the hub and replace the factory bush with the whiteline bush were the rear camber arm bolts to the bush on the hub? Am 99% sure i put the new bush in the camber arm but just want to make 100% i am putting the bush in the correct place before i install them. Just about to install the rear camber bushes now, but it looks like the end of the rear upper arm already has factory camber adjustment (never knew gtr's had adjustable camber on the rear from factory)??? The bolt that goes through the rear of the arm with the bush already has a big offset washer with degree markings on it, when you turn this bolt it moves the top of the hub, hence giving you the ability to adjust positive or negative camber. Do i mount the new bush in the hub now then?? to do the inner as well. the factory inner only gives you about -/+ 0.25 degrees of adjustment. The whiteline will give you -/+ 0.75 degrees or so. both of these are usually enough to correct camber unless you're running super low in which case you need to replace the inners as well. How hard is it to remove the hub assembly to do the 2nd rear camber kit? Anyone had both sets of bushes installed? not sure, havent done the lower arm.